As a percentage of the American workforce, unions have fallen for nearly 50 years, to a point where more than 92% of the private sector is union free. Read more. Make no mistake about it, today's unions are a business. And, like any other business, unions have expenses. Unions' expenses are paid for by the hard-earned money from workers (called union dues), the majority of whom are required to pay dues or be fired from their jobs. Despite the fact that unions currently rake in more than $10 billion a year in union dues, union bosses still have to contend with a nearly $16 million per day payroll to pay themselves and their staffs. Read more. As unions have lost millions of members over the last 25 years, and like any business that loses marketshare, unions have been forced to consolidate and merge. In fact, some unions have even gone out of business altogether. However, today's labor union bosses know that the only way for unions recoup the dues money lost by so many union members having lost their jobs, unions must unionize America's union-free on a massive scale. 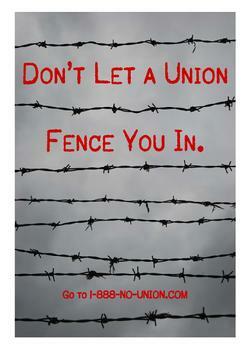 However, you do not have to become a victim of today's union bosses. For more about your rights, go here.